los angeles based japanese guitarist, producer, and composer (tetsuya moriguchi) specialized in blues, R&B, acoustic, gospel, and soul music. mojtrax is a Los Angeles-based original unit founded and led by guitarist, composer and producer Tetsuya Moriguchi a.k.a T-Jam. 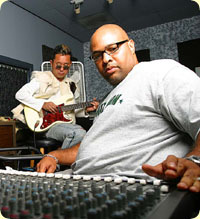 The unit includes industry veterans Richie Vanilla and Kenny Harris. While the band rocks, they draw as much upon R&B and Rock/Pop fusing the best of these styles to produce vibe-heavy, smooth grooving elements. mojtrax is the result of the singular vision of Tetsuya Moriguchi a.k.a T-Jam. Always doing things his own way, he left a career as business man at Sony in Tokyo to come to America and play guitar professionally. Since then, he's been something of a musical chameleon: producing artists, recording his own music, producing CM jingles for tons of Japanese companies. As a result, mojtrax just doesn't sound like any other band out there. mojtrax's sound so unique, in part, because they draw upon such a wide range of influences. They combine rock beats, with the sensibilities of R&B music. "I listen to everything," states T-Jam, "I left Japan because everything over there is a copy of the real deal here." Because he's coming at it from that angle, T-Jam sees music as being either good – or bad – and refuses to deny himself the chance to be influenced by any real good music. T-Jam and mojtrax had some success with an earlier version of the band. They recorded two CDs that sold well, and received critical acclaim in Japan on the Kioon/Sony label late 90's. Now T-Jam and mojtrax are poised to hit the L.A. scene with their grooving, soulful blend of rock. Tetsuya Moriguchi is a guitarist, composer and producer living in Los Angeles. In the twenty years that he has lived in the United States, he has done everything from owning his own record label, to negotiating licensing and recording deals, to producing major CM jingles, videos and albums in the U.S. and Japan. Most recently, he has been getting back to his roots – creating, recording and performing his own original music – with his smooth groove, vibe-heavy band, mojtrax. When Tetsuya was a small boy, living in Tokyo, he had dreams of big ships and planes that would take him to America. Not even a teen, he picked up the guitar mainly to meet girls – well, he was 12 – and immediately gravitated towards rock and rollers like Santana and the Beatles. After college, he took a lucrative job with Sony Enterprise Inc. (marketing the original Walkman) that would have meant a life of security and safety. Yet something was missing… Hanging out an American R&B club in Tokyo called "MUGEN," he had the opportunity to meet stars like Confunkshun and Rufus and became fast friends. They asked him, "Tetsuya, what is your dream? What do you want to do?" He realized then that his life wouldn't be complete until he took a risk and made the move to America to pursue a career in the music that was consuming him. Two weeks later he was on a plane to Los Angeles. In the beginning, life in America wasn't easy. He was naïve to the ways of the music industry and was often taken advantage of. At one point, struggling to pay his bills and put food on the table, he had a life-changing event: Tetsuya had the chance to play gospel music at the First AME Church in Los Angeles. He hadn't grown up with gospel, barely knew any gospel tunes at all, and was just playing what came to him. After a few weeks of Sunday services, he was approached by three elderly women, who were moved by his playing – so moved that they taped his playing, listening to it throughout the week and used it to calm and heal themselves. It was here that Tetsuya realized – he had made it as a musician (!) It didn't matter whether it was these three elderly women in a church instead of 50,000 screaming arena fans – his music was moving people's heart. From that point on, his music and day-to-day life was infused with a newfound sense of purpose and confidence. Throughout his career, Tetsuya has worked on a wide variety of creative projects. At Konnichi Music Inc., he produced commercial jingles for major Japanese companies including Honda, Nissan, Toyota and Sapporo Beer. He founded his own label - T-Jam Records – working on all phases of recording, producing and promoting over 20 artists worldwide. Later, he would combine his marketing and music talents, working in the marketing department of Hollywood's famed Musician's Institute. Today, Tetsuya is devoting much of his time to mojtrax. He is currently playing every Sunday at The Church of Devine Guidance in Los Angeles. 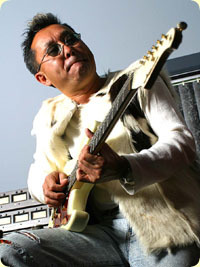 As Johnny Graham of ex-Earth Wind & Fire said of Tetsuya's guitar playing, "you've got your own unique sound happening." Now with, with the rise of mojtrax, it seems that a lot more people will be hearing Tetsuya Moriguchi's unique, soulful sound. copyright© 2005-2019 mojtrax all rights reserved.